Skating in 1,000 NHL games might take a long period of time to net, but for Todd Bertuzzi, who recently reached the milestone, it certainly didn't feel that way. He's told the story many times, a conversation that took place in the early stages of his big-league career, some 16 years ago during his rookie season with the New York Islanders. And he was no doubt reminded of it the past week, as the days counted down to his milestone moment (one recognized by the NHLPA) that came on February 20, when Bertuzzi appeared in his 1,000th NHL regular season game in an afternoon game against the Minnesota Wild. 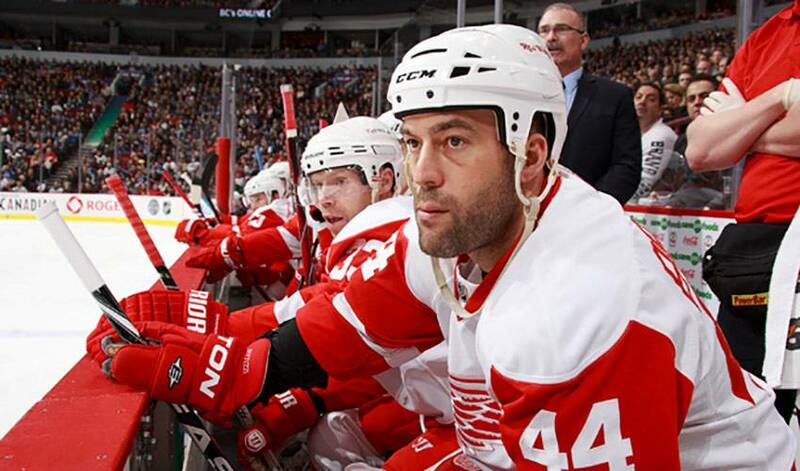 Fittingly, Bertuzzi scored the clinching goal in the shootout versus the Wild, helping the Red Wings to a 2-1 victory. Blessed with size, 6'3”, strength, 230 pounds, and a heavy shot, Bertuzzi, the 23rd overall selection of the Islanders in the 1993 NHL Entry Draft, has been a force as a power forward over his time at hockey's elite level. As he did in his four Ontario Hockey League seasons with the Guelph Storm, Bertuzzi scores goals in every conceivable fashion. Whether it's putting himself in front of the net to either tip in a point shot or pounce on a rebound, or showing soft hands by picking the top corner, turning on the red light has never been an issue for the 36-year-old. He made his NHL debut on October 7, 1995, and scored in a 4–4 tie with the Boston Bruins. Bertuzzi finished his rookie season with 18 goals and 39 points in 76 games. After two-and-a-half seasons with the club, he was traded to the Vancouver Canucks, his longest tenured team in the NHL. He enjoyed the most successful seasons of his career with the Canucks, being named a First Team All-Star in 2003. In the summer of 2006, Bertuzzi was traded to the Florida Panthers, with whom he briefly played for until being traded again to the Red Wings. He then played single seasons with the Anaheim Ducks and Calgary Flames before returning to Detroit in 2009. “I was very lucky during my time with the Islanders to be surrounded by so many great veterans,” recalled Bertuzzi, who shares the Canucks record for longest point-scoring streak of15 games with Petr Nedv?d. “Mick Vukota, Mathieu Schneider, Pat Flatley, Kirk Muller, Wendel Clark – I grew up watching these guys and then I was lucky enough to get play with them. Amazing is an appropriate way to describe Bertuzzi's play of late. In recent back-to-back games against Original Six rival Boston, ‘Bert' scored twice in each game, both Red Wings victories. But when talk turns to his career, including a 46-goal, 97-point campaign with the Canucks in 2002-03, it's not how many times he's scored that Bertuzzi beams about. Rather, it's his relatively new outlook on the game, a more complete playing style, in which he takes great pride in. “Coach (Mike) Babcock has really helped me out,” praised Bertuzzi, of Detroit's bench boss. “I've changed my game over time and I say that in a positive way. It really is a positive. I've been able to transfer my game into a more well-rounded approach. It's been good for me. There's not much missing from his hockey resume, one that includes four Most Exciting Player Awards (2000, 2002, 2003 and 2004 with the Canucks), except for a Stanley Cup ring. The two-time All-Star Game participant would love to see his name etched on hockey's most prized team trophy before he decides to hang up the skates. And if it doesn't happen, it won't alter his view of his career.